The N7717 Stealth Elongated Toilet Bowl from Niagara Conservation is an Ultra High Efficiency Toilet that uses only 0.8 gallons of water (3.0 Liters) per flush. The Stealth technology has truly changed the market in that it features a low-profile body, ultra quiet flush, and patented hydraulic technology. 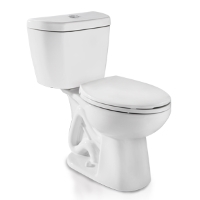 The low friction, smooth ceramic surface of the toilet bowl allows for clearing with every flush. Toilet can adapt to fit a 12" rough installation. The Stealth line of Ultra Efficiency Toilets easily replace existing toilets. By saving 37% more water than even High Efficiency Toilets, they reduce water consumption and costs like no other models out there!